It is extremely difficult to choose natural gemstone rather than wearing it. There are ample numbers of factors which need to be taken into the account while purchasing a gemstone. Usually, a person due to lack of awareness is compelled to buy a synthetic gemstone by counterfeit gemstone dealers. 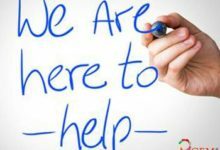 Nevertheless, if you are heading toward to buy a natural gemstone, so in that case, the following article will assist you in purchasing a right gemstone. The quality of a gemstone is graded principally upon the following four parameters Cut, color, clarity, and carat. Hence, these are the key criteria’s which are meticulously evaluated in order to grade a gemstone. Thus, we will discuss below all four essential factors in detail below. The value of a gemstone primarily depends upon its color characteristics. In the context of colors, there are three primary colors red, green, blue and three secondary colors (purple, orange and green). These colors are mixed proportionally to obtain new colors. Usually, the colors which are visible to us are the mixture of these primary and secondary colors. Apart from this, Saturation, Hue, and tone of the colors also hold quite an importance while grading a gemstone. It means the colorfulness of a color relative to its own brightness. The saturation of a color will be decided by a combination of light intensity and how much it is distributed across the spectrum of different wavelengths. The purest color is obtained when a single wavelength passes through the spectrum of light assist in obtaining a high quality or graded gemstone. However, if the intensity of the wavelength decreases, so as the saturation decreases, consequently, the grade of the gemstone also been affected. 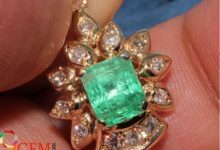 However, it is impossible to obtain a 100 percent Saturation in nature, but higher the saturation, consequently, the price of a gemstone will be higher. The Hue of a color is described to be the pure color without any inclusion and tint. In addition to this, it generally means that how our brain perceives specific colors red, green and blue. The different hues are considered to have a different wavelength in the spectrum. The red, green, purple, blues are defined to have perfect hue. However, the hue of a color change according to fashion. So, the gemstones which reflect the rich amount of color such as red, green, purple and blue are regarded as high graded color gemstones. When a color is added with white that is being called a tint. It has been said occasionally about tint that the lesser the tint betters the hue of the stone and lesser the saturation. So, a gemstone with fewer tints is regarded to be the high color graded gemstone. 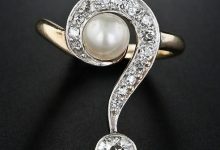 Color grading in the context of the gemstones, means that what is the strength of the main color persist in a gemstone? 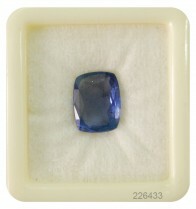 For example, if it is a blue sapphire stone, so while evaluating this gemstone specifically on the color grading parameter. It is being evaluated that in what quantity the blue color persists in the stone. Fortunately, if the quantity of blue color is 100 percent in the stone, it will be regarded as the natural blue sapphire stone. However, it is almost impossible to spot a gemstone without any inclusion. Nonetheless, in that case, a stone with a lesser number of inclusions being confirmed the high-quality gemstone. After color, the other parameter which holds paramount importance while grading a gemstone is considered to be the clarity of the stone. More precise definition of clarity is that a gemstone without any inclusions or with “few inclusions” “large inclusions”. 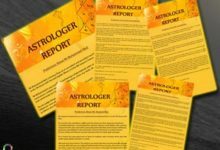 However, in order to perceive the more accurate and precise results generally, the gemstones are categorized in the following categories on the basis of the number of inclusions. These gemstones are completely internally flawless and free of any inclusions. Even, under the 10 X magnifier no as such inclusion can be spotted. It stands for (very very less) inclusions. It is a cumbersome task to spot a flaw in vvs gemstones as these are completely flawless gemstones. However, in order to find any inclusion in the stone, 10 mx magnifier is used which barely reflects any flaws. These stones contain slight inclusions which can be caught by under the 10x magnifier or by competent gemstone experts. 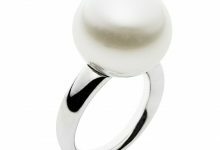 It stands for slightly included inclusions in the stone which can be measured with an experienced pair of eyes or under the magnifier. However, in comparison to VVS, VS, the stone which lies under this category are slightly low in quality. These gemstones are highly influenced by external inclusion and quantity of the inclusions are such high so that it can be spotted with bare eyes. 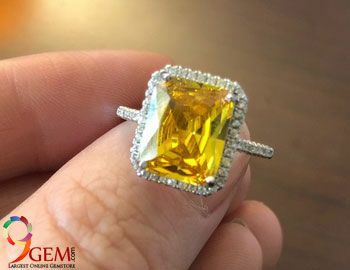 The stone which possesses the quality of transmitting the light through it without any diffusion or bare infusions is regarded to be the transparent gemstone. Translucent: Hence, the stone allows passing the light through it. However, the stone is not revered as “transparent”. The gemstone which does not let the light to travel or pass through it. A gemstone is extracted from the mines or from deep forests. Thus, they appear dull and asymmetric. However, in order to use these gemstones for jewelry purposes. These gemstones are introduced to cut into different shapes considering in mind the inclusions in the stone. A rough gemstone is needed to cut because the stone which is extracted from mines are immensely large in size. 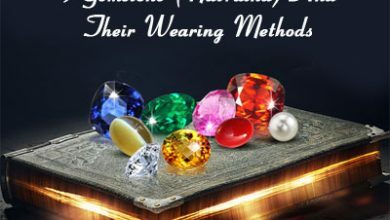 So, the process to make a gemstone assume a certain shape, size, bringing out its luster and shine and enabling the stone to be embedded in jewelry the whole process will be aggregately called cutting of a gemstone. However, cutting a gemstone is quite different from cutting a diamond. While cutting a gemstone, it should not be cut generally in uniform shape because a gemstone possesses certain inclusions and properties which should be maintained while cutting a gemstone. 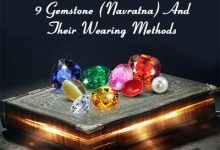 Thus, a gemstone is cut in such an ideal manner so that it possesses its original qualities and exhibits its original color, an acceptable number of inclusions and its scintillating brilliance. Typically, the gemstones are cut in two ways, either in faceted gems (gems with geometrically shaped flat polished faces) and non-faceted gems (those gemstones that do not have geometrically shaped flat polished faces such as Cabochons). A rough gemstone is authorized to be cut by the gemstone cutter with minimum two years of experience. The followings are categorized to be the best types of cut, which a rough gemstone can be received. The rough stone securing this type of cut is regarded to be the best type of cut gemstone. As the stone which receives this type of cut looks apprehensively beautiful. 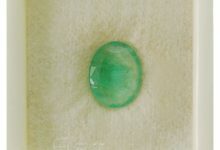 However, not all gemstones can perceive this type of cut because the cut of the stone principally depends upon the shape of the stone, inclusions and aesthetic values. Round brilliant cut gemstones are announced to be the best quality of cut which a gemstone can perceive. It is also acknowledged to be the American standard cut. However, nobody, in reality, knows about who is the real inventor of this cut. Although, this cut is extremely famous because it essays 57 faceted. The diamond chiefly perceives the round brilliant cut treatment. Usually, the benefits of the round cut are that it uniformly divides the facets of the stone and also enhances the luster and shine of the gemstones. However, earlier this cut was not only practiced on diamonds but nowadays gemstones are obtaining this treatment. Baguette cut gemstones have 20 faceted. This cut has been exercised upon rough gemstones, especially for Tourmaline. Square cut stone has at least 57 facets. Basically, this stone has to be cut in step by step procedure to achieve a perfect square cut stone. Most oblong cuts are step cut means the stone has to cut in steps just like a pyramid with its top chopped off. Usually, the stone with square cut denotes justice, equality, truth, and satisfaction. The number of facets of trillion cut stone has been counted around 43. A trillion cut stone is triangular in the shape. Due to the excellent way of cutting the stone from the corners the stone reflects brilliant light and lusters from corners. Moreover, because of its high clustering characteristics, this gemstone is popular among the gemstones buyers. 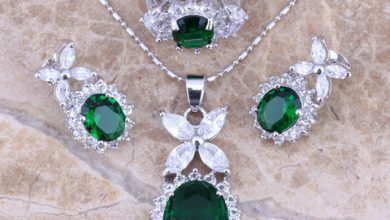 The gemstones like emerald, aquamarine, diamond and white sapphire receive hugely this cut as they possess a brilliant luster and shine. This type of cut is a hybrid cut gemstone which possesses at least 71 facets. Moreover, the pear cut stone is a combination of oval cut and marquise cut, it’s shaped like a teardrop. The pear cut gemstone resembles high brilliance and luster. The pear cut stone looks elegant and compliments neck highly when adopted in the form of a necklace or pendant. The octagon cut gemstone usually have 53 facets. As like square cut stone, it is also cut in steps. The emerald cut gemstone also falls in the category of step cut stone. Generally, the emerald cut gemstone has approximately 50 facets which enable it to look apprehensively brilliant with stepped cases. The shape of the stone which has perceived emerald cut resembles the square shape with stepped increment. The stone looks like a rugby ball and it has got 57 facets. In addition to this, the marquise cut gemstone is also called “Navette Stone” resembles alike a stretched oval shape. The marquise cut stone bequeath excellent brilliance and luster. The number of facets of this stone is around 64. Additionally, this stone is revered as “pillow cut stone” or “candlelight stone cut” in reference to cuts designed prior to electric lights. This stone also means as “classic” stone. In comparison to other cuts; this cut has introduced in recent times. The number of facets of princess cut stone is around 76. Importantly, the princess cut stone is not only bound to diamond, though, it is used primarily for gemstones. Due to its high brilliance, it is principally used for engagement rings, wedding rings etc. Mirror cut stones were used since ancient times to cut gemstones. It is also regarded to be the “thin stone”. Due to its excellent luster and shine, it was used in earlier times to polish diamond and cut rough gemstone. So these are the main types of cut, which a gemstone can perceive. 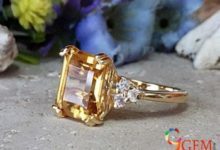 However, apart from this, there are other cuts which can be exercised upon the gemstones like Concave cut, Millennium cut, Cabochon cut, Buff cut, Briolette cut. Except for cut. Color, clarity, the other extremely important parameter which we do need to consider while grading a gemstone is carat. Carat is supposed as a unit of mass which is used in measuring gemstones. It was found that the unit carat comes into existence around 1920. Additionally; one carat is equal to 200 mg.
Apart from other essential parameters the weight of the stone also holds paramount importance while grading a gemstone. The weight of the gemstone also makes an impact on the price of the gemstone. Hence, as the carat of the stone increases in the same proportion to the price of the stone will also increase. Apparently, a rough gemstone carries much weight, which needs to be scaled down by eliminating the redundant materials persisting inside the stone for example: separating inclusions from a stone. As a result of this, the size of the stone and the appearance of the stone enhances brilliantly. Instead of this, it is not mandatory to purchase a high carat stone. Although, you are advised to purchase a gemstone by keeping in mind your budget, since due to the advancement in technology, nowadays, a gemstone with lesser in carat even appears elegant and suppose to bestow all the benefits which a person seek from a gemstone.